under construction and will probably be fully operational by late 1974. Construction is proceeding at [China’s] second gaseous diffusion plant, at Chin-k’ou-ho [Jinkouhe], and it is likely that this plant will become fully operational sometime in 1975. According to Chinese official histories and a scientific paper estimating radiation exposure to Jinkouhe workers, the plant began operating in 1970, years before the above assessments. Why the discrepancy? A lack of good imagery. 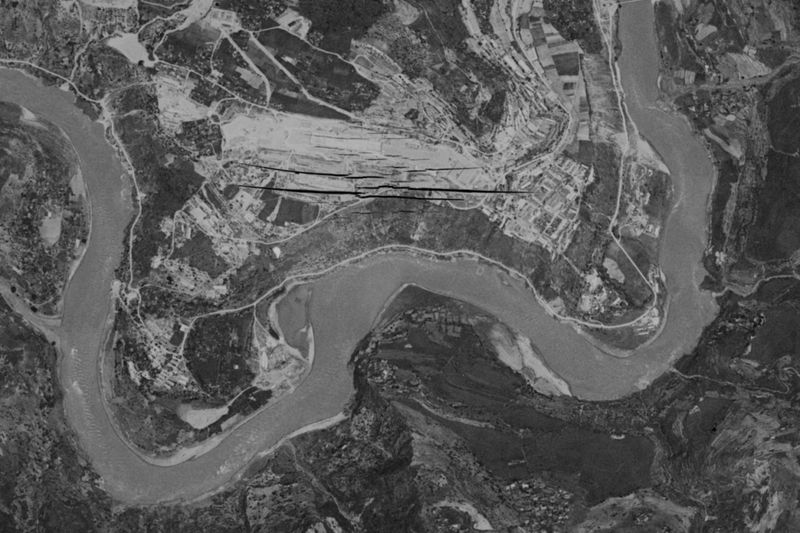 Many of the early estimates on the Chinese nuclear weapons program relied on aerial imagery. I went through all the declassified Corona images now available from the US Geological Survey, and the last good image that analysts had for both the 1972 and 1974 assessments was from August 1968. Looking at the catalog, there appear to have been quite a few attempts to acquire imagery in 1969, 1970, and 1971, but unfortunately for the US Intelligence Community, Jinkouhe happens to be in a gorge consistently shrouded in clouds. Out of curiosity, I went ahead and purchased the 1968 image. Can you spot the site of the Jinkouhe GDP from this altitude? Here is the site of the Jinkouhe GDP in 1968. Construction is well underway, with many of the support buildings and an electrical substation already finished. The foundations of the two gaseous diffusion halls are taking shape. Damage to the film (in the worst possible spot) is obvious. I do not know if the film was damaged in the archiving/digitizing process, or if it was already damaged when the analysts viewed it in 1968. A six year gap in imagery from 1968-1974 was, to say the least, unfortunate. The ease of acquiring (and analyzing) commercially available satellite imagery today stands in stark contrast to the difficulties analysts faced 45 years ago. The US Intelligence Community also had difficulty analyzing China’s first gaseous diffusion plant at Lanzhou: an early incorrect measurement of the size of the main gaseous diffusion hall introduced uncertainty into estimates on Chinese SWU for decades. Today, we can use GIS tools to measure the size of buildings with a degree of accuracy of which analysts then could have only dreamed. The work of our community in monitoring nuclear developments around the world directly benefits from this new reality. > A lack of good imagery. Like Dwayne Day’s articles on the Soviet N-1 lunar program in The Space Review, this reminds us that, at the 99% level, the information the US had on secret Soviet and PRC matters in those days came from imagery and, when applicable, ELINT. Not many spies with access.